How New NEAT Science Reveals How to Be Thinner, Happier, and Smarter. If you’ve ever struggled to lose weight via the traditional diet and exercise route, “Move a Little, Lose a Lot” may be the book for you. According to author Dr. James Levine—director of the NEAT Center at the Mayo Clinic and an authority on preventing and treating obesity—reducing food intake and going to the gym for the purpose of losing weight is both unnatural and unsustainable. Yet, in his view, no gym + no diet can still equal significant weight loss. How can this be? According to Dr. Levine, the root of the problem is that most Americans have “sitting disease.” In other words, they spend 10, 12, 15 hours a day sitting—in the car, at work, or in front of the computer or television—thereby losing the chance to burn 1,500 or more calories per day. Dr. Levine says the cure for this so-called disease is to simply get moving, the rationale being that regular low-intensity non-exercise activity thermogenesis (NEAT) effectively burns calories, while at the same time improving overall health by boosting metabolism, lowering blood pressure, and increasing mental clarity. The beauty of Dr. Levine’s prescription for weight loss is that it’s easy to get started. It’s as simple as taking every available opportunity to walk, stand, and bend. One might climb the stairs instead of riding the elevator, or pace while chatting on the phone, for instance. Taken to its extreme, one might install a “treadmill desk” at one’s office and pursue “work-walking” (walking on a treadmill in front of a computer/phone) in lieu of, say, pre-dawn aerobics classes. Another plus is that with no gym membership to buy, no support group meetings to attend, and no pre-packaged food to order, the NEAT approach requires little or no financial investment. So consider picking up a copy of “Move a Little, Lose a Lot.” And take a stand against sitting. 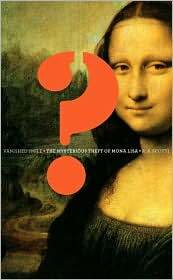 Vanished Smile—The Mysterious Theft of Mona Lisa, R.A. Scotti, Knopf.